Arrived on the day it should have done well packed no problems thanks. Great battery had one before. Great product and great value. Really cranked the engine over effortlessly compared to the standard battery! 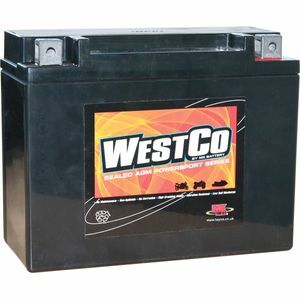 Great battery for the price, I use it in my Renault Sport Clio. Works very well even in -7 degree cold & very fast postage. Excellent battery.. Goldwing fires instantly now. Extra quick delivery too. . Excellent service Easy fit. Seems quite good quality. Not yet had chance to test. YOUR service excellent, but your couriers service poor, item left at neighbours - no card left, had to make 2 calls to courier next day to find out location. Unacceptable sorry. Your quality of service has been excellent as it was the first time i placed an order with you some time ago, that's why you received repeat business! Speed of delivery is outstanding and no hiccups through the ordering process. If only other companies did as well!!! No problems with the battery, working brill as compared to my old lead acid. nothing was too much trouble when I rang to place my order, (making sure I had the correct battery for my bike). Overall highly recommended. Pete. Great product (turned my Harley over a treat and it fired straight into life), great price and fast delivery. Couldn't recommend this company more. Buy with complete confidence. Great! No longer have to stop at the top of slopes in case the bl****y thing won't start again. To all Z1300 owners, treat yourself!!! Good website, very clear shipping and cos information. Very quick delivery will recommend to my club mates on our technical forum. Good product. Thanks very much. Absolutely fantastic service. Lovely lady advised over phone exactly what I needed. Battery is a perfect fit and my dead mower sprung back to life. Would highly recommend and have given contact to my mower service shop.